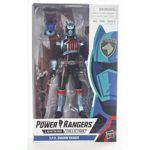 Power Rangers Lightning Collection- Wave 1 In Package Images! Even more new images from the new Power Rangers Lightning Collection have been released online! Thanks to GrnRngr.com for the discover! These are the first in-package shots featuring White Ranger, Lord Zedd and the Shadow Ranger! As previously speculated, the Shadow Ranger has an unmorphed head based on the American Doggie Kruger design. MMPR White also comes with a head resembling Tommy Oliver. Zedd however does not come with a separate head. Preorders for these new Lightning Collection figures have not yet been opened at the time of writing. Stay tuned to TokuNation for further details on this remarkable new collector series! The hits keep on coming with the surprise first look reveal of the upcoming Bandai America Legacy Power Rangers SPD figures! Featuring fan favorites SPD Red Ranger, SPD Blue Ranger, SPD Green Ranger, SPD Red Ranger, and the first ever release of the SPD Black Ranger, this exclusive set to Toys’R’Us is sure to impress! These figures feature the top-notch quality you’ve come to expect from the premiere Power Rangers toy manufacturer. Check out our full gallery and review of this can’t-miss set! Releasing at the end of April, surely on a bunch of Fools would miss out on this release! The good people at Shout! Factory have announced the next Complete Series DVD release for Power Rangers! Next up is Power Rangers SPD– featuring the adventures of the Space Patrol Delta facing off against the sinister Troobian Empire. SPD: The Complete Series will be released on DVD on March 14, 2017! The price is a very modest $19.97 USD for all 38 episodes! And that brings a close to a round of exciting match ups that much like Morphin’ Madness had it’s share of upsets, surprises, & expected victories. What do you think of the final outcome of Megazord Madness? Let us know in the comments below!